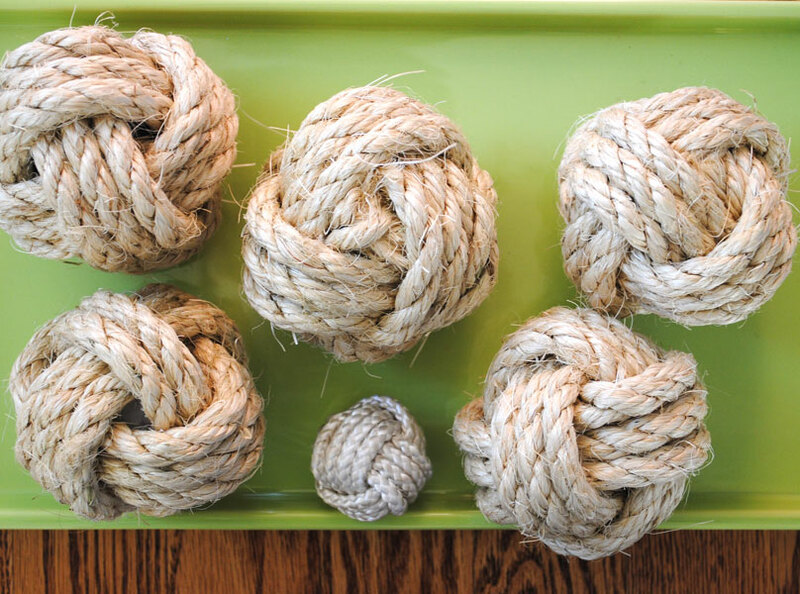 Here is my first bit of beach inspired decor, gorgeous textured rope balls. They were in quite a few of the little gift shops I visited last week but at $10 a pop I thoughts I’d have a go at making them myself. 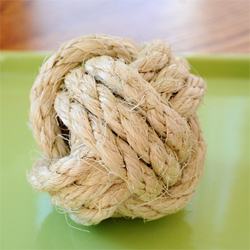 Thanks to this great video on YouTube I am now a master of the Monkey Fist knot! 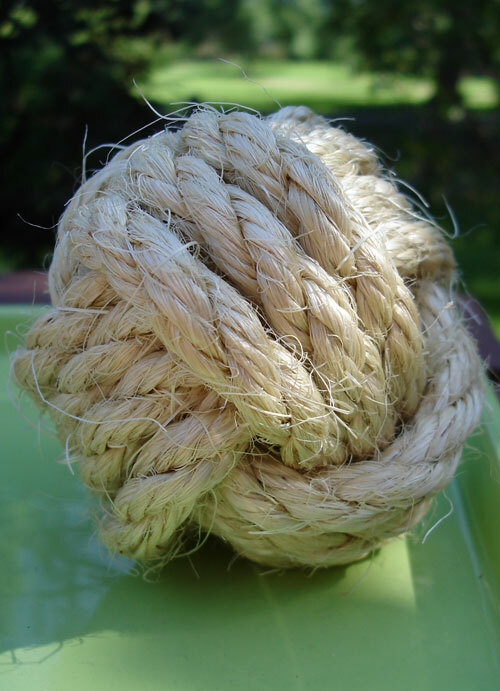 This entry was posted in Coastal Crafts, Coastal Decor, Decorative Accents, Rope. Bookmark the permalink. Oh I like these too – thanks! these are great!! will definitely try your idea..thanks! These are so creative! I absolutely love this! These are great! I think I will definitely have to try this out! Oh my gosh I love these! Thanks for sharing!!! These are so neat! I was wondering what you use for the centers? Thanks for sharing. These are different! I see them in stores, but never a tutorial on how to make them. I have a light house/ beach theme bathroom, this would add that last touch it needs. I can't wait to try these! Thanks! Lindsay, Rose and Heather thanks for the invites to your link parties. Jo at theCreativeCollage the centers of the larger balls are golf balls and the smaller balls marbles. I saw these in the Ballards Magazine as a doorstop. The price was outrageous. I am so glad you shared. Hmmm…Now, what to put in the center to use it as a door stop? Thanks for stopping by and answering my questions – I'll be in search of marbles and golf balls now! Very creative Idea. I can't wait to try this one. New follower from the Creative bloggers hop. Hope you stop over for a visit. Have a great week. My husband has been playing with paracord lately and attempted to make one. Yours turned out awesome. I will be sure to share with him! New Follwer from Homemaker on a Dime. thanks for sharing and linking up. love these. i am very into the beach accents allover blog land. we featured you today. These are gorgeous, so summery! I would love to see you link this up at Freestyle Friday, going on now through Sunday night. I'm so going to have to give these a whirl. I collect monkey fist knots, but never took the time to learn how to tie them. Or ask super knot master hubby to show me how. The ones you made are so fun! Adding you to my bloglist of blogs I'm reading this week. Great site! Thank you for guest posting on my blog today – your post on decorative balls is just fantastic! Your rope balls are cool too, I REALLY have to make me some! Thanks for sharing! I am soooooo trying this! Coming over from Inspire Me and a happy new follower! just wanted you to know I 'pinned' your rope ball! love it! Before starting to wrap the ball, place a large rock or something heavy in the middle. Makes a great door stop that can be hung on the knob when not in use!! what do you do with the ends of the knot so they don't show? 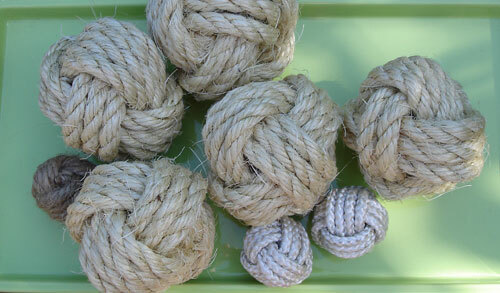 Hoping to make some with sisal rope. Thanks!! Tuck then in…not easy, I think I used a pencil to help them on their way!